Cole Anthony is the reigning EYBL Regular Season Defensive Player of the Year. A constant ball-hawk, Anthony gets in your grill and doesn't let you breathe. He's crafty, quick and intelligent with his aggressiveness. He's everything you want in a defensive point guard. The scary part? He might be better on offense. That argument was presented during Anthony's four-game stretch in Dallas. The 6-foot-3 floor general averaged 27.8 points per game on 56.7 shooting from the perimeter. Anthony scored 111 points in four games, and accounted for another seven points a game through his passing (3.5 APG). He single-handled willed them to a win against an extremely talented Brad Beal Elite (MO) squad, racking up 35 points, three assists, three rebounds and three steals. His numbers are impressive, but it's his poise and composure that stands out when watching him play. Anthony is never rattled, and is always in attack mode. His consistent mindset results in a massive amount of production across the floor - especially offensively. 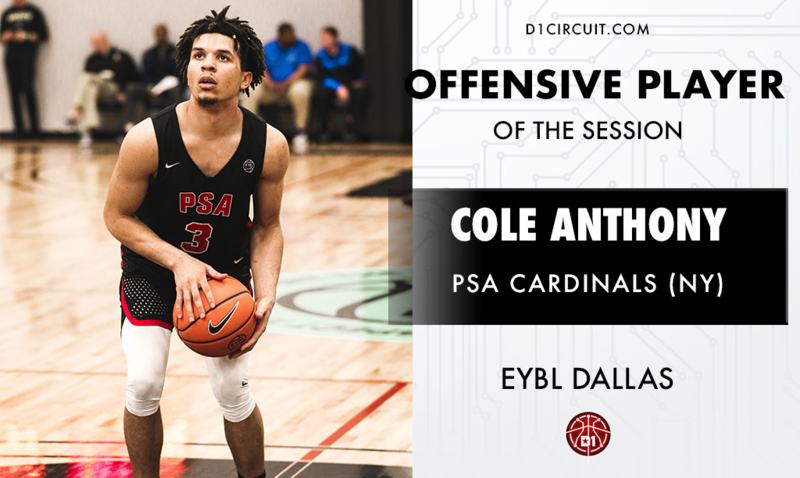 "Cole is the most productive player in the class of 2019," said Director Munch Williams, who has been Anthony's head coach on PSA for the past three season. Winning is the most important thing to both Anthony and Williams. With Anthony leading the team, Williams knows he's in good shape on the scoreboard. "(Cole) has always found a way to help his team win at every level."